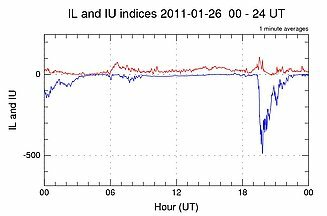 The Hum Intensity in Bangor dependence on electrojet indices from personal observation. It has recently been shown that the Hum may be due to interaction between world power systems of different frequency standards. It has further recently been shown that Hum levels are maximised when there are what seem like artificial signals and/or narrow band spikes in pulsation magnetometer recordings and minimised when these are absent. In this present study we seek a far more quantitative approach, subjective Hum levels on specific dates and importantly at specific times are compared with quantitative plots, so called IMAGE electrojet indices, by courtesy of the Finnish Meteorological Institute. The method uncovers a profound and indisputable relationship. 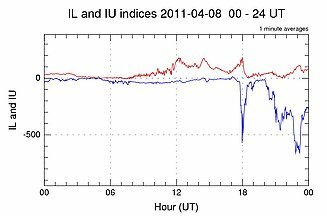 Essentially when the electrojet current components IU and IL are balanced and at zero or close to zero the Hum intensity maximises. On the other hand when they are finite and imbalanced the Hum intensity is zero or minimised. The hypothesis is twofold. Firstly, it is proposed that the electrojet will be easier to modulate artificially at minimal current resulting in maximum artificial infrasound radiation and maximum artificial ground (telluric) current flow in turn yielding maximum artificial electro and magneto –seismic effect, i.e. maximum Hum. Secondly, when the electrojet currents are large and imbalanced external modulation will be more difficult and in any event there will be maximum natural infrasonic and seismic noise and maximum natural telluric signal amplitudes and hence no or little opportunity for the Hum. Interestingly these criteria will be expected to minimise not only a Hum caused by power line interactions but also Hum caused by virtually any anthropogenic interactions. 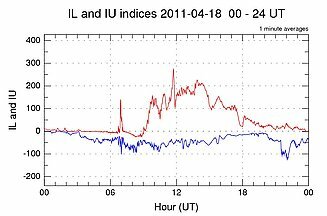 Observation of the behaviour of IU and IL also explains why the Hum is usually but not exclusively regarded as a nocturnal phenomenon. The Hum is an acoustic (possibly also magneto- acoustic) phenomenon known about since the 1970's is somehow related to modern infrastructure and recently has been receiving much more press publicity and partially thanks to the present author, scientific credence. Those afflicted either physically hear or otherwise somehow perceive a characteristic sound. This was tone matched by some Hum hearers in the USA to between 30-80 Hz with quasi-periodic modulation between .5 and 5 Hz. In other words the sound is rather like that of a distant idling engine or if one can imagine a giant bee trapped in a muffling bottle, its tones octave shifted downwards to account for its size. At the time it was also stated that some people could hear the Hum in sound proof enclosures and inside Faraday cages which for people with only an average grounding in science gave the Hum sorts of supernatural properties. However, we should not loose site of the fact that even the best sound proof or anti-vibration chambers are only good down to about 150 Hz and that a Faraday cage only screens the electric component of an electromagnetic wave. Recently there have been more amateur proponents of UHF/Microwave theories of the Hum. The author has received several anecdotal reports from such individuals in the USA and UK. Without wishing to dismiss these out of hand it is evident that many of the reports come from anti-mobile phone lobbies and anti-smart metering lobbies, particularly in the USA wherein smart metering and smart grid technologies have been advanced as an alternative explanation from that of the author to account for the time line of the Hum. Indeed one such proponent has a website which has science that simply does not add up. For instance, it wrongly refers to sub-harmonics as harmonics and refers to frequencies of 254 Hz, 1500 Hz and 48 KHz none of which are referred to in the original tone matching studies of the Hum. In any event, a simple study using a radio scanner shows that none of these signals contain modulation features like those encountered in the Hum. The author believes the pulsed electromagnetic technologies might, nevertheless, conceivably be relevant in that they might sensitise the ears or neural apparatus in some way to be more receptive to the Hum without being the prime mover for the Hum themselves. This would then account for the increased number of Hum hearers in areas with an already developed infrastructure. Some cases of the Hum have been shown to be due to simple low frequency noise pollution but others, indeed by far the greater majority, have proved far more elusive. Any proper explanation relevant to this majority of Hum cases must be able to account for the start up of the phenomenon in the UK being some two decades before the start in the USA! The tantalising paradox is that the Hum seems to be increasing around the World wherever there is infrastructure and yet in the 1970’s both Britain and the USA had similar infrastructure, yet Britain had the Hum and the US did not. 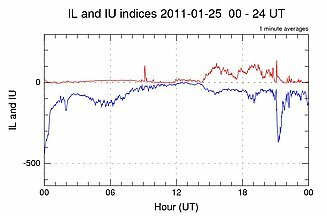 Very recently indeed, the present author has proposed that influences of power grids on the magnetosphere can account for this1. From that study, the author deduced that certainly in Bangor, Wales’s instances of the Hum seem to coincide with the reception of power line harmonics re-radiated from space. Frequencies as low as 82 Hz have been reported to have been received at antipodal distances2 and since 60 Hz is close to a natural Schumann resonance of the earth-ionosphere cavity3 and since power line emissions are naturally ‘bursty’4 and thus alone could yield the quasi-periodicity of the Hum. The question is do we need the involvement of any other frequency components at all? With several years worth of available data there is the potential for a far more in depth, but horrendously time consuming study. 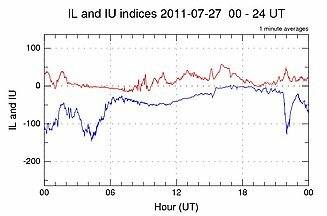 However, in order to get these very important results released into the public domain as soon as possible the data sets have been limited to a dozen of the most significant Hum and no Hum periods in late 2010 through to August 2011. The Finnish data is an archive data set and sadly not available in real time otherwise it would make an excellent predictor for the Bangor Hum. A series of plots of IL (blue) (lower) and IU (red) (upper) indices follow together with original comments in quotation marks on Hum intensity taken from the diary of the author. Figure 5: January 26th 2011 ‘Moderate Hum between 2-6 am’. Figure 11: 27th July 2011 ‘No Hum’- a pleasure to be in bed! Despite there being a huge amount of data above, the analysis is striking simple and obvious but the significance for Hum sufferers is profound. 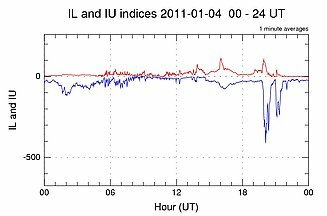 When IL and IU are at or close to zero and closest to each other this is when the Hum is maximised. 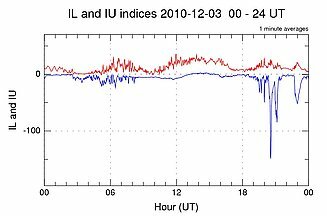 In figures 5-8 and 12 the original diarised comments of the author indicate specific times when he experienced the phenomenon of the Hum subjectively at its worst and these times correspond exactly for those figures the closest approaches of IL and IU to one another and to zero. 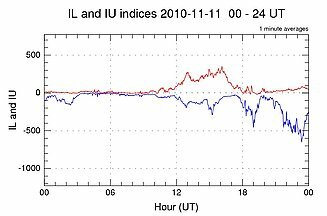 Conversely when IL and IU are furthest apart, particularly when IL has a large negative value and/or when IU is positive then there is no Hum. 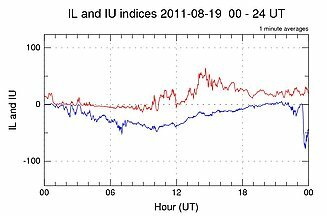 Also in nine out the twelve results considered IL and IU fulfil this condition particularly with IU positive mainly in daylight hours which helps explain anecdotal reports of the Hum being mainly a nocturnal phenomenon, assuming we can make the extrapolation from the Bangor Hum to ‘Hums’ in general. The plots also offer an additional explanation as to why the Hum is heard by some to fade in and out or even to switch on and off. This will simply be governed by the time rate of slope of IL and IU towards each other and zero. The steeper this gradient, the more likely there will be perceived a fairly abrupt switch on of the Hum. The overall explanation offered here is two fold. Firstly it is proposed that the elctrojet will be easier to modulate artificially at minimal current resulting in maximum artificial infrasound radiation and maximum artificial ground (telluric) current flow in turn yielding maximum artificial electro and magneto –seismic effect, i.e. maximum Hum. Secondly when the electrojet currents are large and imbalanced external modulation will be more difficult and in any event there will be maximum natural infrasonic8 and seismic noise and maximum natural telluric signal amplitudes9 and hence no or little opportunity for the Hum. Interestingly these criteria will be expected to minimise not only a Hum caused by power line interactions but also Hum caused by any anthropogenic ground borne interactions, seismic or electromagnetic. This does not rule out therefore Hums caused by gas mains, container vessels and Hydro-power plants, for example. Nor is it incompatible with previous observations of the author relating to earthquakes and the stress and tilt factors affecting seismic propagation of the Hum. 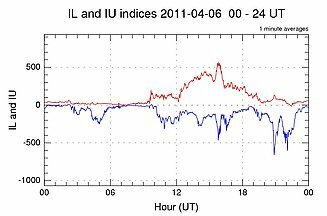 It is certainly worth pursuing further investigation of the behaviour of IL and IU before and after large earthquakes. There is of course a natural growing interest in the scientific community in potential methods for earthquake prediction. These results offer further hope to Hum suffers. 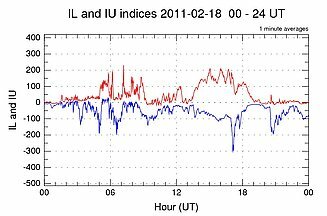 There is already a US Internet site which provides space weather ‘forecast’10. Perhaps, hopefully, in the not too distant future we will also see it or similar providing a ‘Hum forecast’. The real upshot is that perhaps Hummers in addition to simply having oversensitive hearing11 may actually be a very privileged group of individuals with a sort of sixth sense who are more highly tuned than most to the earth’s natural signals and magneto-acoustic outputs. Such sensitivity, for example prior to earthquakes, is well known elsewhere in the animal kingdom12. Yet in humans the downside of such sensitivity is the inability to cope with or process anthropogenic modulation of earth’s natural signals which manifests as the Hum. His wife Gwyneth for valuable discussions on the Hum and comparisons of Hum level etc. Dr Kat Patrick for discussions on Hum frequency components and anecdotal Hum reports from the UK and near Austin, Texas. What is the physical meaning of the AE index?